Ah! The Brussels Grand Place. So many books have been written about it, so many visits made, from one house to the next, from one pavement to the next. BrusselsLife.be has, on your behalf, met up with Jean Van Calck living encyclopedia of this "Town Square" and its surrounding areas. Ah ! La Grand Place de Bruxelles. Que de livres n'ont pas été écrits sur elle, que de visites n'a-t-on pas suivies, de maisons en maisons, de pavés en pavés. Et pourtant, elle recèle encore des tas de secrets. 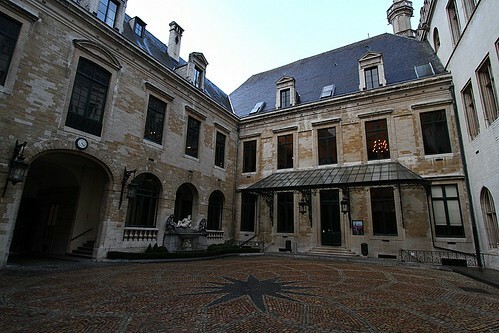 In the Town Hall's interior courtyard, there's a star on the ground, which issued as the reference mark for the numbering of all the houses in all the streets of Brussels! It is also served as the point zero for all distances from anywhere on roads to Brussels. In 1986, the national football team, the Red Devils, reached the semi-finals of the World Cup in Mexico. Many still remember images of the Grand-Place, adorned in the Belgium's black, yellow and red! All in all, over 30.000 people chanting for the 22 players waving from the Town Hall balcony. Every two years since 1971, the Grand-Place is embellished by a magnifiscent carpet of flowers. Several hundred thousand begonias are assembled to form a floral fresco on a particular theme of the moment. The Grand-Place Number 9 today houses a gourmet restaurant, Le Cygne. A certain Karl Marx, exiled and finding refuge in our liberal land, wrote his famous "Manifesto" there. 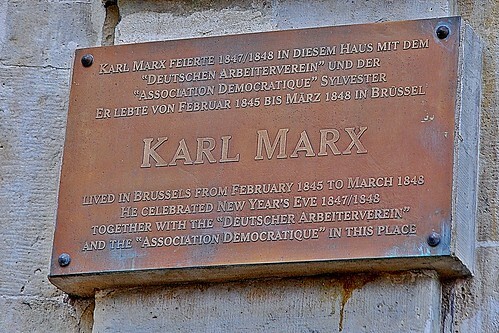 Later, it was also there that the Belgian Labour Party was created. Belgium hasn't executed anyone in over half a century. But until the 1950's, a symbolic sentence was given in front of Town Hall: two police officers would stand in front of what could be best described as a guillotine. In front of it was written the name of someone who had been sentenced to death. Nowadays, the death penalty is banned from all Belgian courts, turning the sentence into prison for life. Since December 1998, the Grand-Place has been classified as a UNESCO World Heritage Site. But it wasn't so long ago that the Grand-Place was used as a gigantic open-air car park, with the traffic proceeding around it with gay abandon.